« I have an obligation to use my talent! I am a member of city o clay and we have swaps there. They are real fun and I get to see what everyone had made because I am the one doing the shipping. So one of the swappers Tabatha Pimentel sent in beads that had eyelets OMG what fun. Some of Tabatha’s work can be seen here. I love her work she is so talented which is probably why she finished her beads this way. I can not show you hers since she is in the swap and I can not post her pictures until the swap is finished so I hope I have done her justice by this attempt. Here are the eyelets. These are from Joanne’s I am sure you can get them online. I would like to find some sterling silver ones to use. (Writing on the to do list!) 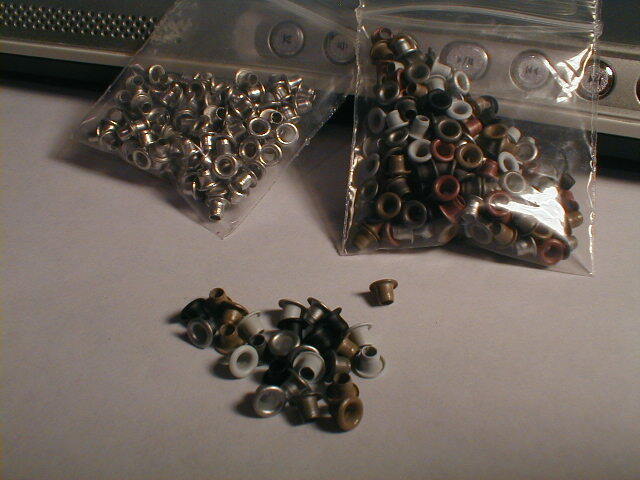 They are the Craft Essentials 1/8″ Eyelets. I am sorry but can I just say that picture looks freeken good. Okay no light box but that is a good close up (patting herself on the back). Is this the correct way of using eyelets? I have no idea I am telling you what I did and BTW it was really easy. What I did was to make a bead, then poke my hole with a poker, make the hole bigger with a clay shaper, insert eyelet, work eyelet in by rolling in your hands. They still need more time in the tumbler the idea you want to get from this is the eyelet idea for finishing your beads. Try it you will like it I think. 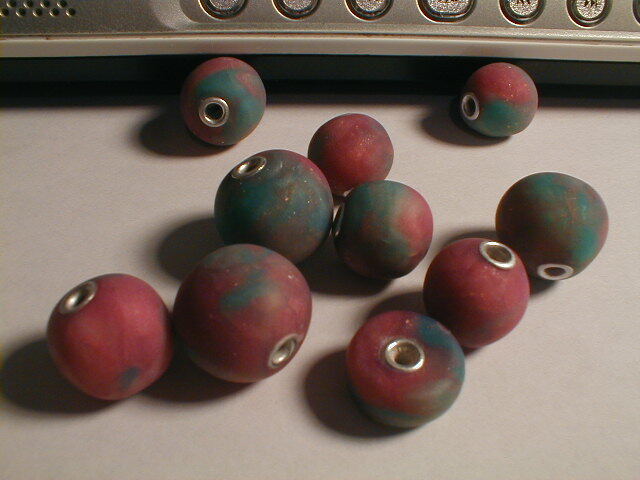 The one thing I do recommend if you are using scrap clay try to get it as close as you can to the color of the bead. I used white scrap and you can see the scrap. Looks Tacky. Another idea would be to use a contrasting color for interest Hmmmmm that is a cool idea as well. What can you come up with? Or have you already done it? Take care and have fun claying! This entry was posted on January 24, 2010 at 5:58 AM and is filed under Tutorial. You can follow any responses to this entry through the RSS 2.0 feed. You can leave a response, or trackback from your own site. What could you recommend in regards to your publish that you simply made some days in the past? may as well check things out. I like what I see so noow i aam following you.